Graphics -- The antiqued note on every page hints at mystery in the Sherlock Holmes mode. But no giftwrapping can take away the bang from the content here, which is designed to draw comeback traffic per episode of the cliffhanger tale on display. 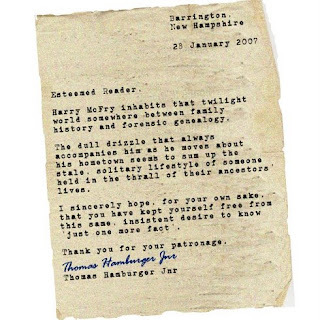 Content -- In hard copy Harry McFry and his 'missing family' case would be something to cuddle up with on a rainy afternoon or under a beach umbrella. The first chapter made me get a subscription, because it cranks up your curiosity like anything. Mr. Hamburger has hit on a really crowd-drawing idea. Style -- What the literati would call kitschy in the way Harry Potter is, but who cares when you're hooked on McFry's adventures? Recommend -- How about one illustration per chapter, even if it's only from online image files? Electronic media needs more visually, don't you think, Mr. Hamburger, because it's not a gold-leafed, leather-bound artprinted book that smells good and feels luxurious. Thank you so much for your review and your kind words! You're so right about the need for more illustrations - I'll try to remember that as I rattle towards the end of my griping (sic) tale. I appreciate your time in reviewing Harry McFry and will be dropping by for more tips on style over the weeks ahead. Today, I got so excited when the page loaded and I saw Chapter 113. Yes! I began reading then realized I had already read it. So I did what any avid reader does in this situation…read it once more and loved it. Must agree with you ladies…Thomas is a wonderful writer. Harry McFry makes my day. Thank you for such kind comments - Chapter 114 is 'in gestation'!